Shane fought valiantly for his country’s freedom. Now, he’s fighting for his own. Shane was only a sophomore in high school on September 11th, 2001, but as soon as he saw the twin towers fall, he knew exactly what he would be doing after graduation. Shane enlisted in the Army immediately after graduating from high school in 2004. He was deployed to Iraq in 2005. The end of a dream Shane never could have imagined how quickly his dream of serving his country would come to an end. It was September of 2006. Shane was stationed in Baghdad, Iraq. He had the day off, but he took a shift for his friend—a mission that ran overnight and into the next morning. His team was on their way to get food when they were hit by an EFP (Explosive Force Projectile). Shane lost both of his legs and survived three cardiac arrests that day. Soon after, he would lose the ability to read and write due to the impact of traumatic brain injuries. 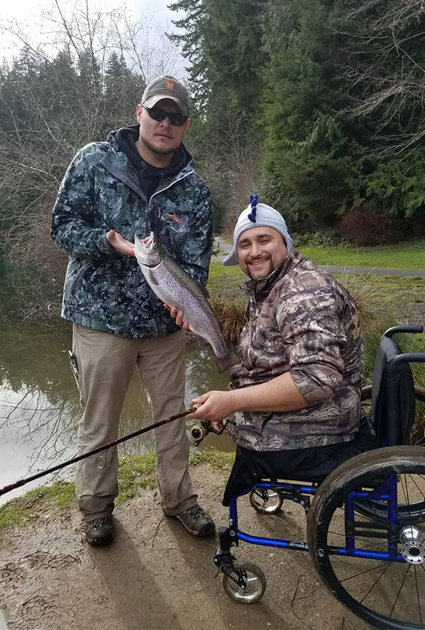 Shane never could have imagined how quickly his dream of serving As Shane and many other veterans whose lives have been changed by Mission Outdoors would tell you, it’s not just about hunting and fishing. We take combat veterans hunting and fishing because we believe that hope grows outdoors—on the water, on a hunt, on the slopes, on a trail—but just as Shane said, it’s more than recreational activities. It’s relationships with brothers and sisters who understand. It’s the restoration of hope. You can restore hope for a veteran today. And you can do it by giving freedom back to someone who fought for yours.